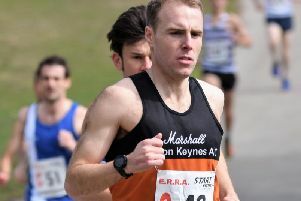 MMKAC and the Milton Keynes Distance Project again organised the annual British Milers Club PB Classic at Stantonbury track. Here no less than 464 young athletes (ranging from 12 to 20 years of age) from around the UK competed. There were 45 races, all with a suitable pacemaker, racing 800m, 1500m or 3000m plus 1500m and 2000m steeplechase events. On the day over 50% of the competitors (51.7 per cent) ran personal bests. From the MK Distance Project four PBs were set: Mintu Sidhu (M17) 1500m (4.20.93); Ella Nash (F15) 800m (2.37.32); Amy Milne (F20) 800m (2.41.97) and Harley Mackenzie (M13) 800m (2.39.32). For Marshall Milton Keynes AC there were 20 PBs set from 31 competing athletes (64.5 per cent) and where Imogen King again improved her F17 club 1500m steeplechase record, this time by 3-seconds down to 5.16.48.